The Funny Bone is looking for Virginia's Funniest College Student. The show will be held at the Richmond Funny Bone and consist of a local emcee, four college students and a nationally touring headliner. The students will be selected via an audition process being run every Saturday during the month of February. The Contest will begin on Wednesday, March 3rd, and concluded on Wednesday, March 31st with our winner being crowned. Kenny Smith is a regular on the Bob and Tom Show and has appeared on Jimmy Kimmel Live. A favorite on the college comedy circuit. Also look for him on the Fox Network's "The Jimmy Kimmel Show". Kenny Smith, is a young comedian on the rise Just ask him, he'll tell ya. You can hear him regularly on the Bob & Tom Show. Already a favorite on the college circuit, Smith has been working hard making a name for himself in comedy clubs across the country. 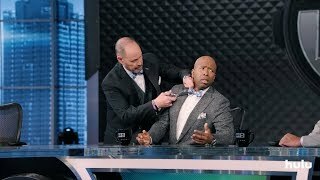 Kenny Smith is always keeping his eyes open for any television opportunities that may come along. Young, fresh, loaded with energy, and just a lot of fun to be around, Kenny Smith is a guy who knows how to stir things up and keep audiences roaring with laughter.